July 1 deadline for compliance is approaching. RF Technologies (RFT) HELP ALERT® Mobile Panic Alarm for Hospitality was featured this week in a news story (WTTW-TV, Chicago) highlighting the recently-enacted City of Chicago ordinance intended to protect hospitality workers from sexual assault and other forms of intimidation and violence in the workplace—and an upcoming July 1 deadline for industry compliance. Originally sponsored by Alderman Michele Harris, 8th Ward, and backed by labor unions including Unite Here Local 1, the anti-harassment ordinance stipulates that employees working alone in Chicago hotels must be issued mobile panic alarms (such as RFT’s HELP ALERT) that would enable them to immediately alert security if they encounter uncomfortable or potentially dangerous situations during the course of their work. Hotel workers are already wearing such devices, including RFT’s HELP ALERT, in cities including New York and Washington, D.C. In Seattle, similar protection is included as part of Initiative 124 (also referred to as I-124) under which hotels are required to provide hotel workers with panic buttons. Similar mandates and/or ordinances are in-process and are likely soon to be adopted in areas in California (Sacramento and Orange County), Nevada (Las Vegas), and elsewhere. Such protection is being requested with increased frequency by staff members and local unions representing hospitality workers. 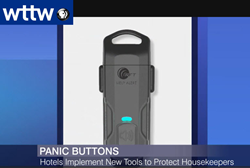 WTTW-TV feature, click here: https://chicagotonight.wttw.com/2018/06/25/starting-july-1-chicago-hotels-will-need-have-panic-buttons.